Fear is something that needs to be respected – listening to it can save you problems and in some cases, it saves your life. This is what Mark Abma, one of British Columbia’s renowned park skiers, told me in an interview earlier this season. He also said that stepping into fear is where he’s able to learn more about himself, about his sport. If you’re looking for an indicator of the world’s perception of Canada’s economy, you might consider the exchange value of our currency, hovering around 75 cents U.S.
After winning the World Cup Men’s Downhill, what’s left to do for Rob Boyd on the slopes? With the possible exception of recent Canadian Olympic gold medalists Maelle Ricker, Ashley McIvor and Alexandre Bilodeau, few skiers have experienced the kind of euphoria that Whistler’s Rob Boyd did on a historic day in 1989, when he took a full-throttle approach at a course set in his own backyard and won what is still Canada’s only World Cup Men’s Downhill victory on home turf. Global Relay stores and manages petabytes of communications data in a private cloud that uses proprietary software to support fast retrieval of archived communications. Focusing on the financial industry, it meets the regulatory, surveillance and archiving needs of 20,000 customers in 90 countries, including 22 of the world’s top banks. The company posted revenue this past year of $53.1-million and has been growing at the rate of 30 to 35 per cent a year. Started in a farmers market 10 years ago by sisters Jennifer Carlson and Jill Vos, Baby Gourmet is now a multimillion-dollar company with products available in major stores throughout the United States and Canada. Almost a third of Canadian parents are expected to purchase its organic meals and snacks this year for their babies and toddlers. Key selling points are great-tasting, wholesome ingredients, creative recipes and pouch packaging. The company also markets nutritious snacks for school-age kids under the brand name Slammers. “In terms of our success factors, Number one was understanding our consumer. We had two great founders who understood what parents’ and children’s needs were, and they went on to create products with high nutritional value and great taste. These products are made with some pretty sophisticated ingredients – a couple years ago you wouldn’t have thought of serving your baby vanilla berry risotto. Founded in 1985, Cooke Aquaculture has grown from one marine cage site and 5,000 salmon to a farmer, processor and seller of salmon, sea bass and sea bream with annual sales approaching $1-billion. The geographically diverse company runs its own hatcheries, farms and processing facilities, as well as the sales and service side of its business. “In 2004 and 2005, the multinationals that dominated East Coast salmon farming were experiencing serious challenges, and in some cases were prepared to close their businesses. This would have been devastating for local economies, so we made the decision to purchase operations of three major companies. Not only was this dramatic growth a challenge from a business perspective, it also presented a major challenge from a corporate culture perspective. But the decision proved to be the right one, and helped us become the company we are today. In the last four years, dentalcorp has acquired more than 140 dental locations across Canada, making it the largest provider of dental services in the country. Working with more than 1,700 staff and 300 dentists, it has grown to a $300-million-plus company by bringing business expertise to the practice of dentistry, while allowing practitioners to retain clinical autonomy and professional independence. “Our raison d’être is to revolutionize the business of dentistry in Canada by combining the art of business with the science of dentistry. The biggest challenge was bringing something brand new to an industry that had existed in its current form for 100-plus years. It took a reasonable amount of time to find the revolutionaries who were willing to take a chance on a new model. Fiera Foods provides baked goods to retailers and food service companies, producing artisan breads, muffins, bagels, croissants and other pastries for Canadian and international markets. Founded in 1987 as a small bakery, the company, including its allied group of companies, has had double-digit growth for the last six years and employs more than 1,400 people. It has just completed a multimillion-dollar expansion and further plans include a new factory to produce its own margarine. “We’re a family-oriented company but with our growth we’ve had to augment our team with professional management and processes. We looked at how other family companies have transitioned and learned a lot about management thinking. We asked ourselves where we wanted to be in the next five years, the next 10 years, then attracted the people who fit our strategy. It’s a fine balance to be a large corporation while at the same time keeping the things that have made you so successful. Kids & Company provides corporate childcare services for employees throughout Canada. By the end of this year, it will have more than 70 centres, including five in the United States. Capitalizing on changing demographics and the increasing trend toward two-earner households, the company has enjoyed double-digit revenue growth each year since it started in 2002. “We really innovated in the childcare market, and that has been our key driver for success. We don’t charge late fees and we don’t have waiting lists. We guarantee spaces to our parents for whatever they need, so it takes the pressure off working families. Medgate sells data management software to environmental health and safety professionals in large global corporations, particularly in such sectors as oil and gas, mining, chemical manufacturing and utilities. Its goal is to help prevent employee illness and injury. The company has reached revenue in excess of $30-million annually and is growing at a rate of over 30 per cent a year. “The key to our success is an extraordinary corporate culture based on core values of customer satisfaction, product innovation and respect for employees. We have passionate employees who are absolutely committed to the success of our customers. It’s amazing what happy employees can accomplish. Nicola Wealth Management has nearly $4-billion of assets under management. Serving high-net-worth families, the company has seen profit growth of around 25 per cent per year, making it one of Canada’s fastest growing mid-size investment managers. The company, which employs more than 130 people, follows an investment philosophy based on diversified asset classes and income-producing products. “One of the biggest factors in our success has been a tiered planning strategy. We have broken the business plan down into various tiers throughout the company – from senior management to individual staff – so that there is clarity around who is responsible for what. Another key to our success is sharing the pie. In the last few years our staff has received profit share that is equal to roughly 25 per cent of their base salaries. This helps align everyone’s interests and fosters a great culture. Skyline has been in the business of purchasing, owning, managing and financing income-producing real estate since 1991. Through the years, “the student rental guys,” as they were once known, have a built a fast-growing company that rents apartments, leases commercial real estate and offers private real estate investment trusts to investors. The company manages more than $2.2-billion in real estate assets in three REIT portfolios, has more than 600 staff, 2,000 investors and nearly 300 properties across Canada. “As we get bigger, there are more opportunities to specialize in unique parts of our business that were simply not there years ago. One challenge was that we had to gain the trust of our investors through our expansion into commercial and retail real estate product offerings, demonstrating that we were capable of growing while staying focused. StarTech.com manufactures more than 3,000 products that provide connectivity for computers and other digital equipment, such as cables, adapters, splitters and converters. With more than 400 employees, the 30-year-old company has grown between 25 and 30 per cent annually over the last three years and is now selling through major technology distributors in 15 international markets. “One of our differentiators is that we are a customer-driven company. We focus on solving our customers’ problems, and we do that by making sure we have a deep understanding of their needs and how our business integrates with theirs. We carry a wide variety of products, whereas a lot of our competitors are focused on one area. Another part of our success is that we specialize in hard-to-find products and make it easy for people to find them. 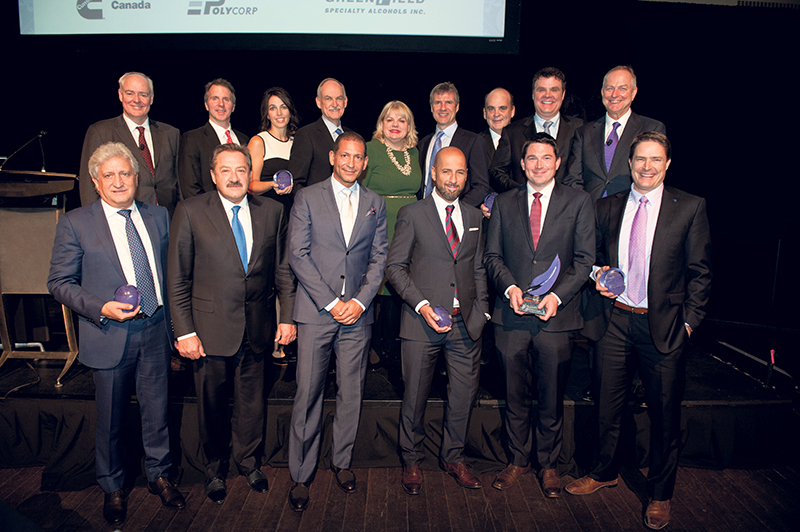 Now in its third year, the Private Business Growth Award – presented by Grant Thornton LLP and the Canadian Chamber of Commerce – honours private Canadian businesses focused on creating strategic, sustainable growth. The award recognizes Canadian-owned, privately held businesses that have been in business a minimum of three years, generate revenues of $5-million or more and demonstrate outstanding strategic growth. Each year, a jury of high-profile business leaders selects 10 finalists and one winner based on demonstrating strength in the following criteria: innovation, market development, people and culture, strategic leadership and improvements in financial measures. Ask Hillary Marshall to describe the importance of airports to the Canadian economy and she may cite a statistic like this: In 2014, more than $79-million worth of live lobsters travelled through Toronto Pearson International Airport on their way from Halifax, many of them ending up in China. Summits that bring world leaders to the table to discuss climate change are generally regarded with a fair bit of pessimism, but the 2015 United Nations Climate Change conference in Paris will be different, believes Toby A.A. Heaps, CEO of Corporate Knights. He’s seen growing momentum in environmental sustainability efforts – an indication that the time is right for announcing an ambitious plan. A serious illness or accident that leaves you unable to work and earn money can happen at any time. Actually, one in three Canadians will experience a period of disability of more than 90 days during their working life. Fifteen-year-old Jack Stuart attends Grade 10 at Handsworth Secondary in North Vancouver. He’s not so different from his classmates – he likes to ski, play sports and is on the basketball team – yet there is always something on his mind. Ski lessons with a qualified instructor can help visitors to British Columbia make the most of their annual ski trip. Lessons are obviously important for those just starting out, but they can also be enormously beneficial to intermediate and advanced skiers, says Jonathan Mosley, chair of the board of directors of the Canadian Ski Instructors’ Alliance (CSIA) in British Columbia. When Saskatchewan Polytechnic developed its Aboriginal Student Achievement Plan in 2008, the institution set out ambitious goals for increasing Aboriginal student success. Today, provost and vice-president Dr. Anne Neufeld feels confident saying that the polytechnic is now a national leader in this area – while acknowledging that there is always more to do to eliminate barriers and support students. Organizations wanting to improve their bottom line would do well to take a close look at their electrical bills. The U.S. Department of Energy estimates that 30 per cent of the US$250-billion spent on energy in the country is needlessly wasted. Who says you can’t make a silk purse out of a sow’s ear? Metro Vancouver entrepreneur Lynn Mueller is proving it can be done by building a profitable business on that most basic of biological products: human waste. His technology of extracting the heat generated by sewage is saving clients around the world big dollars every year. While there are reasons to be pessimistic about the impact of climate change on the environment, Karen Clarke-Whistler prefers to remain upbeat. Presented by the Information Technology Association of Canada (ITAC), the Ingenious Awards celebrate the smart use of technology to improve the performance of organizations and companies across Canada. Nominations are rigorously assessed by two panels of judges, identifying projects with the highest standard of excellence that achieve outstanding results. ITAC is proud to present the 2015 winners. Their stories represent innovative, transformative – and downright ingenious – approaches to challenges and opportunities.